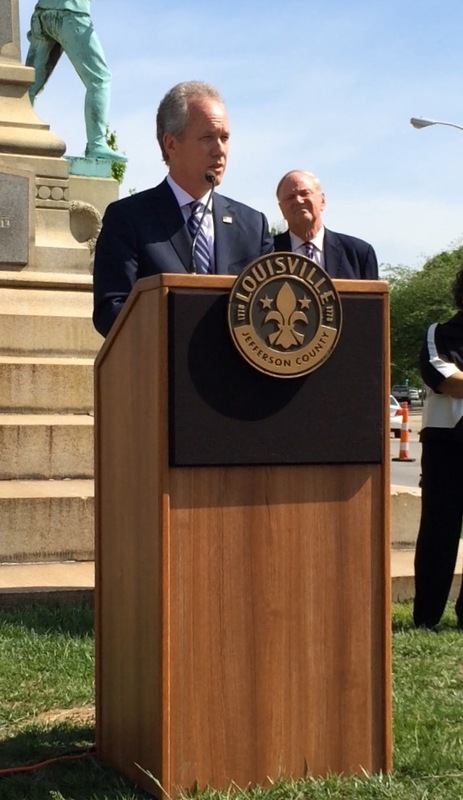 Mayor Greg Fischer announces the removal of the monument. City workers began dismantling the highly controversial Confederate monument on the north end of U of L’s Belknap campus Friday. The 70-foot monument faces north and commemorates Confederate soldiers who fought in the Civil War. Completed in the 1895, the monument has stood for 120 years on Third Street, but will be relocated. U of L President James Ramsey said the time was right for the monument to be taken down and followed “the example of civil rights leaders.” Though the statue is not owned by U of L, campus and city officials worked together for the removal of the monument. Ramsey said there was movement from faculty and staff in the past year to begin the process. U of L’s Diversity Committee of faculty, students and staff listed the statue as one of their highest priorities to improve on-campus diversity. Fischer said it was unclear of who owned the statue, but the university, city and state came together to remove it. Until an appropriate historical location is selected, the monument will be held in storage. The statue was donated to the city by the Kentucky Woman’s Monument Association in 1895 to honor the Kentuckians who fought for the Confederacy. After the statue is removed, the median in between second and third street will be replaced with a new lane to help traffic flow to the Speed Art Museum and campus access. Last week, the Courier-Journal published an op-ed written by Pan-African Studies Chair Ricky Jones that demanded the removal of the monument. Jones said he and other on-campus officials have worked for 20 years to remove the statue. Construction of the monument’s removal began on Friday. Chairman of Pan-African Studies Ricky Jones looks on. Mayor Greg Fischer speaks before construction begins. Around 50 people gathered to listen to Ramsey and Fischer. U of L President James Ramsey talks to the crowd. Vice Provost for Diversity Mordean Taylor-Archer speaks. You know, I’m just about ready to argue that the most disturbing reminder of Slavery in this country are Black people, themselves. Not only that but they threaten my serenity and make me feel unsafe. Shouldn’t we, then, remove them to somewhere to be named later? Wouldn’t we be better off expunging our society of this symbol of human depravity? Slavery, I mean. This, on the other hand, is a spit in the face for Americans who served in the military, including my own ancestors, one Blue one Gray, just because one of them happened to fight for a nation who’s politics (which he may or may not necessarily have entirely agreed with,) our current generation doesn’t like. Meanwhile, they conveniently completely ignore that the North was practically as racist, and only went along with Emancipation because Slavery got in the way of winning the war, and the only logical thing to do with the Slaves was to free them. Forward thinking indeed. This era of political hand waving and correctness is just depressing for me.